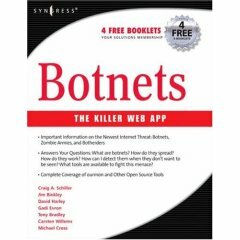 Hawkeye Security Training is proud to host the official website of "Botnets-The Killer Web App" published by Syngress. Our President, Craig A Schiller, CISSP-ISSMP, ISSAP is the primary author of this, the first book available on the subject of Botnets. He assembled an international team of experts to create the most authoritative source possible. Co-author Jim Binkley (Professor of Computer Science at Portland State University) shares his experiences turning a network monitoring tool into a world class IRC botnet detection tool. He then shows you how to do the same. Collaborating author Gadi Evron (Beyond Security) is probably the most recognized name associated with Botnet intelligence and response in the world today. Gadi contributed a chapter on comand and control alternatives to IRC. Carsten Willems, a PhD candidate at University of Mannheim, contributed a chapter on the use of sandbox technology to analyze malicious code associated with botnets. The CWSandbox is available to use free on the Internet. Hawkeye Security Training offers Information Security consulting services and customized training for information security professionals including preparation for Certified Information Systems Security Professional (CISSP®) certification tests, through Portland State University's Continuing Education series. Custom training is available on a variety of information security topics. Since June of 2006 Craig Schiller has served as the CISO of Portland State University in Portland, Oregon. In the Summer 2010 edition of Educause Quarterly, Mr Schiller wrote an article "Is There Safety in the Cloud" with PSU CIO Sharon Blanton, PhD. In March 2010 he was voted best speaker by attendees of two international conferences, IDC Security Road Show-Prague and IDC Security Road Show-Bucharest. Mr. Schiller is the primary author of the first Generally accepted System Security Principles (GSSP) now known as the Generally Accepted Information Security Principles (GAISP). He co-authored Botnets: The Killer Web App, Digital Forensics for Networks, Internet, and Cloud Computing, Virtualization for Security, Infosecurity 2008 Threat Analysis, Combatting Spyware in the Enterprise, and Winternals. He has had many chapters published in various editions of the Information Security Management Handbook, edited by Hal Tipton and two chapters of Data Security Management, edited by Donn Parker from Auerbach Publishing.